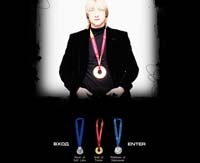 Evgeni Plushenko, who won the silver medal in men’s single figure skating at Vancouver 2010, has not been able to accept his loss of the gold to Evan Lysacek. Plushenko claims the new scoring system was unfair, and that his landing of several quadruple jumps in his program should have beat Lysacek’s performance that included no quads at all. He spent most of last week dissing Lysacek for his lack of quads, then changed his website design, showing his three Olympic medals: his silver in Salt Lake, his gold at Torino, and his platinum at Vancouver. The media jumped on that, and screenshots of it are already all over the Internet. However today, a visit to his website from an American IP address shows the text that proclaims “Platinum of Vancouver” to be gone. The medal itself is still there, but nowhere does he say anything about being awarded a platinum medal. CMR news agency has contributed to the report.